The first week | The Tales of Missus P.
Today I spent the morning on the couch, trying to get this stupid sinus headache/earache stuffiness to go away. 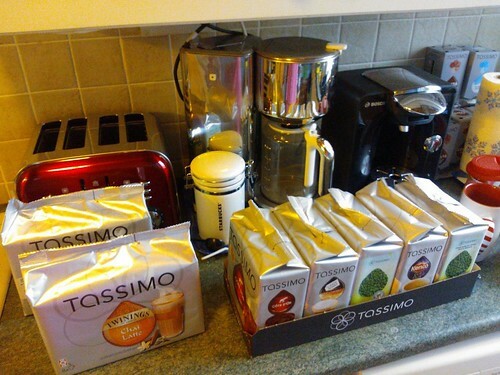 I was awakened by the pleasant surprise of my Tassimo delivery, courtesy of my £20 voucher that I received in the box with the new machine. I think I’m set for quite a while. I also came home to a delivery of a Christmas gift that included a ton of Dunking Donuts coffee. My parents had sent me some Barnie’s Santa’s White Christmas coffee as well, so yeah, totally stocked up for months. My biggest accomplishment today was going to the salon. I decided to ditch the highlights and go for an all-over natural dark brown. I only had my hair dyed at home (and I messed it up really bad on my own, I tell you.) so this was a treat. It was pricier than usual but now I only have to do the root touch ups to keep the tell-tale signs of age from creeping back on my scalp. I bought Steve some more supplies since he’s still feeling badly. I hope we both get over this stupid flu soon. I’m tired of feeling like an invalid and I know he is too. I was thinking tonight that after mentioning the blog post regarding how many blogs writers actually need, I’m going to go back to having my author website forwarded to the blog. I may cross post later on, but for now, I’ll just stick to this since my updates are all here. Tomorrow I plan on going back to the gym for my second jog/walk of Couch to 5K. Wish me luck! This entry was posted in All About Me, Exercise, Shopping, Technology, Writing and tagged beauty, blog, blogging, coffee, hair, salon, Tassimo. Bookmark the permalink.